...an eclectic blog of musings, fun snippets of interest, and historical tidbits - all for your enjoyment. The mystery theme for today is "Hall of Famer." Who could I be? That's the mystery! Go ahead and take a guess and then go enjoy your day. Check back tomorrow and I'll reveal the answer. The first correct post will be declared the winner. Merideth, thanks for checking in so quickly, but it is not Pierre Curie. Looks like a tough one, might a clue be forthcoming ? A deep thinker? But which one? Sorry, the Anon was me - did not intend to hide. I'll try baseball & guess Connie Mack. Leo Baekeland, Lee Deforest, Benjamin Holt. I'll be surprised if any of those are right. To Merideth on the eastern side of WY: Prepare yourself. It's headed your way. 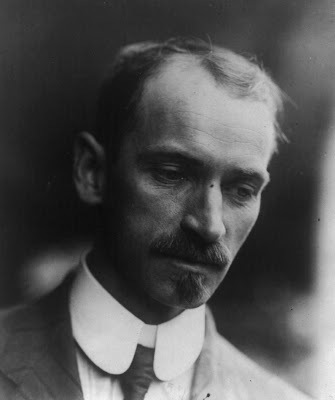 It is Glenn H. Curtiss who is enshrined in the National Aviation Hall of Fame. Wow, Robert, congratulations once again! Where's the post that reveals the story of Glenn Curtis? Happy New 2018 ! - *Times Square, New York (January 01, 1942)* A happy new 2018 to all my readers! next episode: ?